Korean home cooking is set to be the next big trend. 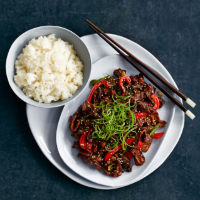 This is our version of daeji bulgogi, a sweet and spicy pork dish usually cooked over a charcoal grill. Serve on rice, or roll up in lettuce with crunchy pickled vegetables. an hour, or overnight if you have time. 2. Heat the oil in a large frying pan over a high heat until smoking hot. Drain the pork from the marinade and fry for 4-5 minutes. You want it to be caramelised in places, so it may be best to do this in batches; don’t move it around too much. 3. Remove the pork from the pan, tip in the pepper and cook for 2 minutes, then add the onions; cook for 1 minute. Mix the pork with the vegetables and serve, with sticky rice, shredded salad onions and a scattering of toasted sesame seeds, if liked.